‘I use and also manipulate basic systems and rules of games or of my own. The structure these rules provide are the starting point of my work. The simple rules are used to issue instructions and outline my strategies in the making of the painting. I also allow an element of chance and self-determination to enter the process in order to introduce playfulness in the face of constrained activity’. ‘Games act as a model for the real world- they provide a structure for activity with an uncertain outcome. 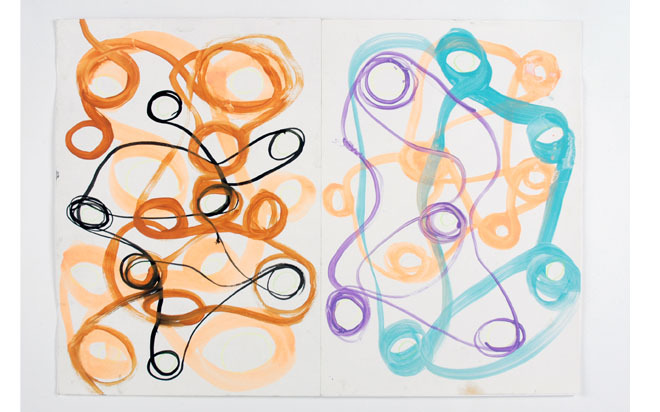 The act of painting functions in a similar way- there are the boundaries of the canvas, the limitations of paint, the conceptual constraints of making a painting, and finally the structure of the environment in which they are shown. I seek to create a space for experimentation and play within this discipline. I want the paintings to have an immense energy, at once vibrant and full of humanity’.